1Assistant Professor in Pharmacology, VIVA Institute of Pharmacy, Virar, Maharashtra, INDIA. 2Assistant Professor in Quality Assurance, VIVA Institute of Pharmacy, Virar, Maharashtra, INDIA. 3VIVA Institute of Pharmacy, Virar, Maharashtra, INDIA. Ficus racemosa also called as Ficus glomerata Roxb. is a species of plant in the family Moraceae. Popularly known as the Audumbar, cluster fig tree, Indian fig tree or goolar (gular). Different parts of plant shows Antibacterial, Antitussive, Anthelmintic, Antidiarrhoeal, Anticancer, Anti-inflammatory activities etc. on various extracts. Latest and previous studies have concluded the beneficial aspects of fruit of the plant shows Antimicrobial, Antibacterial and Antifungal activity using different cultures and extracts. Materials and Methods: The method was adopted for preparation of plant extracts. The media used for antibacterial test was Nutrient agar/broth. The culture medium was inoculated with the microorganism separately suspended in nutrient broth. The antibacterial activity was evaluated by measuring the diameter of zone of inhibition observed. The broth dilution method was adopted for determination of MIC value against the pathogens. Results and Discussion: The ethanoic and ethyl acetate extract showed more promising antimicrobial activity as compared to Water, Hexane and Chloroform extract. In well diffusion method, the ethyl acetate extract had showed significant bactericidal activity. 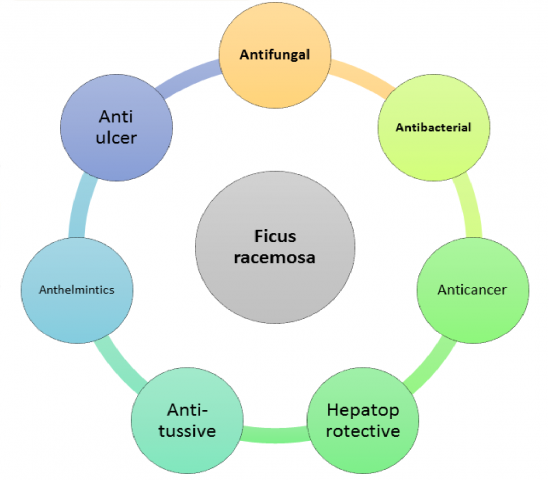 Pingale T, Duse P, Ogale S. Antibacterial and Antifungal Approaches of Ficus racemosa. Pharmacognosy Journal. 2019;11(2):355-357.